Data Centers are undergoing major transition to meet higher performance, scalability and resiliency requirement with less resources, smaller foot print and simplified designs . These rigorous requirements coupled with major DC trends like Virtualization, DC Consolidation, SSD and data growth are putting tremendous amount of strain on the existing infrastructure and adding complexity. To design a reliable, scalable and flexible data center requires careful planning. In this discussion we will highlight some of the unique attributes of MDS 9710 which allow a very flexible and scalable data center design. We will look at some of the DC architecture options with MDS 9710 and review the best practices to improve resiliency and protect against silent failures. We will also discuss how we can design a DC that provides investment protection and agility without making tradeoffs. Big Data, Video, and the Internet of Everything (IoE) are driving high demand for data storage in today’s IT environments. Data centers are undergoing transformation to meet higher performance, scalability, and resiliency requirements with less resources, smaller footprint, and simplified designs. In this webcast we will highlight some of the unique attributes of the new Cisco MDS 9250i Multiservice Fabric switch and discuss how customers can deploy distributed intelligent storage services using this product. This session will focus on SAN Extension as well asCisco IO Accelerator(IOA) storage services and discuss how customers can leverage these services on the 9250i to create solutions for disaster recovery, storage backup, data replication and data migration. This webinar also addresses data center architecture options and reviews the best practices to improve resiliency and eliminate services sprawl . We will discuss data center designs that provide investment protection and flexibility without making tradeoffs. 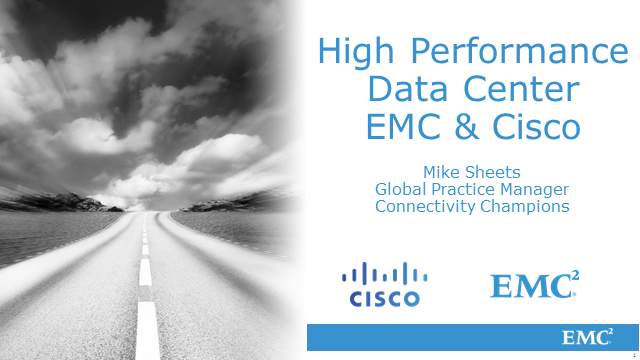 Explore EMC and Cisco services and validated solutions that help customers optimize their data center infrastructure for virtualization and cloud computing. Highly available networks have different meanings for LAN and SAN admins. This session will explore the design principles for a truly converged system, and identify the means by which architects can build highly available networks for both LANs and SANs using converged technologies like FCoE and DCB-based Ethernet. Particular importance will be paid to Role-Based Access and SAN best practices using a converged infrastructure, along with recommendations for growth and scale. infrastructure to virtualization and cloud computing. Cisco and EMC experts address the evolution of the data center beyond storage, servers and networking silo's to become truly virtualized, automated and service oriented, while leveraging existing IT investments and skills.